Ya Jagoff!!! 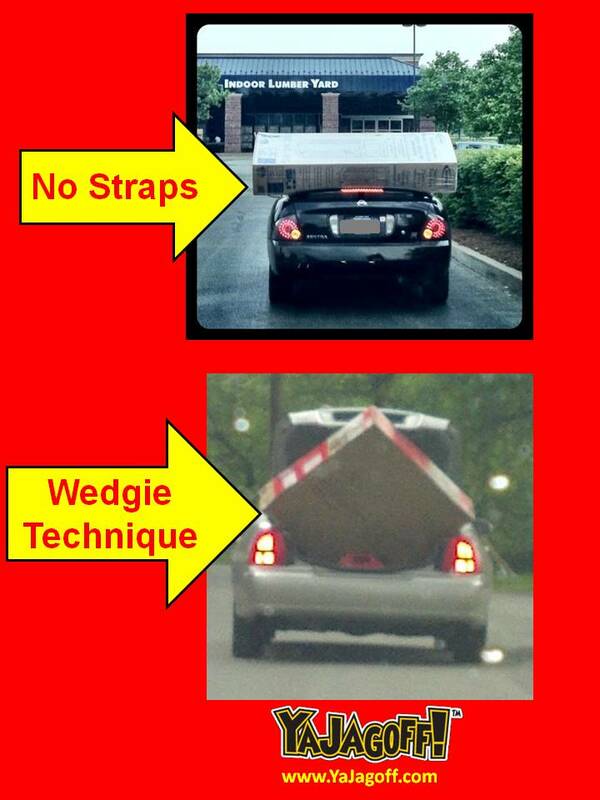 | New Discount Moving Company: "1 Man And A Sedan"
Look at that picture above. It happened right in front of us which is causing us to wonder if our cover has possibly been blown and now people are just PUNKING us by doing something stupid right in front of us. The timing seems impeccable and way too coincidental. 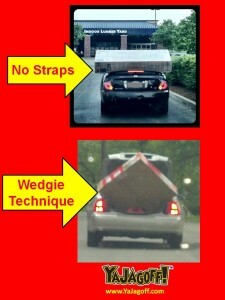 If you’ve been following you know we’ve posted drivers like this that overloaded their car for haul home from the store. Is it some type of new hybrid RV that gets great gas mileage but folds out into something the size of Heinz Field once you park it at the campground? Is this some type of new X-treme mattress-kayaking device? To compete with Pittsburgh’s new Taco Truck, this is the new Perlora Furniture Truck. This is the second date of a bad Match.com hook-up and the dude can’t shake the girl so he decided to totally freak her out by picking her up for dinner with this @#$ on strapped to his car. None of the above, of course. 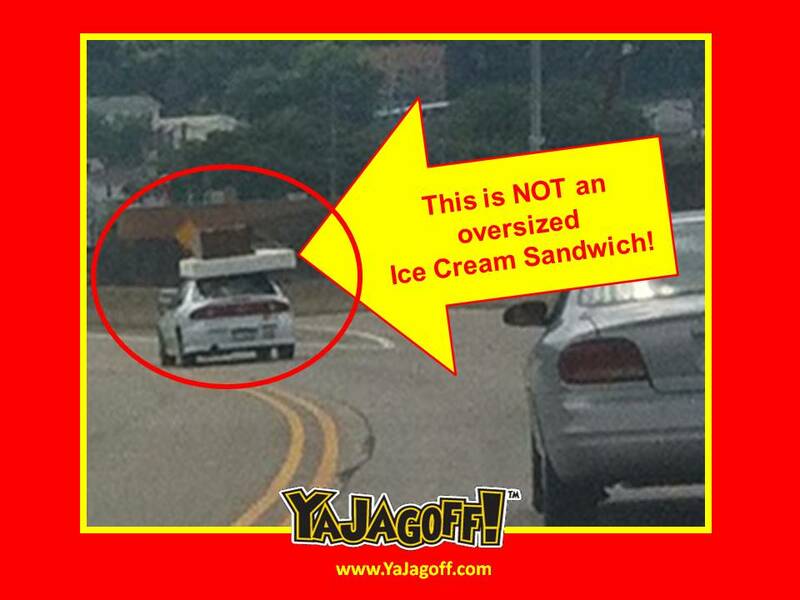 It REALLY IS a car driving with a mattress on it with a dresser piled on top of THAT! Ahhh we get it, that moving company, “Two Men and A Truck” now has a 1/2-priced competitor, “1 Man And A Sedan” but the OHSA folks haven’t quite up to them yet. Hey “1 Man And A Sedan” here’s hoping that your NOT carrying that stuff around cuz you you have Sudden-Onset Narcolepsy combined with Obsessive Compulsiveness which causes you to fall asleep at a moments notice but you can’t really doze off unless you have a fresh sheets straight out of a carefully dusted chest of drawers. We didn’t get a chance to catch up to you but our suspicion is you have a clock radio in there to play music and you’re using a broken night stand as a driver’s seat. Next time, find a buddy with a truck, Ya Jagoff! Like free food and free beer???? 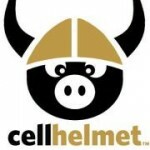 The CellHelmet dudes are throwing a launch party. Click the logo below for deets! Previous articleHey! Who Changed The Parking Angle??? ?